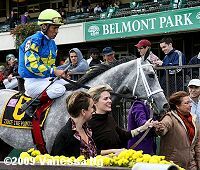 There were three Grade 1 races at Belmont Park on Saturday afternoon, two of which are part of the Breeders' Cup Challenge "Win and You're In" program. In contrast to last weekend, racing conditions were excellent with a fast main track, firm turf, sunny skies, and temperatures in the mid 60's with a crowd of 5,435 on hand at the Long Island oval. The $400,000 Champagne Stakes (G1) features 2-year-olds going 1 mile on the main track, with the winner earning a spot in the Breeders' Cup Juvenile on November 7. A field of six faced the starter, with Hopeful Stakes winner Dublin sent off as the 7-10 favorite. 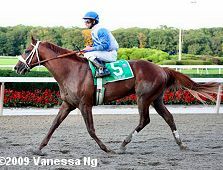 In to challenge him included 4-1 second choice Aspire, second in the Hopeful last out, and 5-1 third choice Homeboykris, a maiden winner last out at Calder and making his stakes debut. 9-1 Super Saver battled for the lead with 6-1 Discreetly Mine down the backstretch through fractions of 22.79, 45.78, and 1:09.51 with Homeboykris and Aspire stalking them third and fourth respectively. 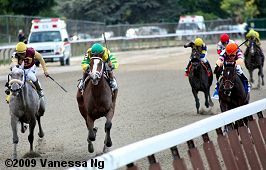 Jockey Ramon Dominguez kept the favorite Dublin back in fifth 3 lengths off the pace. Entering the stretch, Super Saver tired allowing Discreetly Mine to inherit the lead at the 3/16 pole. Jockey Edgar Prado moved Homeboykris wide for the drive and he closed well through the stretch to pass Discreetly Mine at the 1/16 pole to win going away by 1 1/2 lengths in 1:35.12 over the fast track. It was just 1/4 a length back to Aspire third, while Dublin failed to respond when asked in the stretch, finishing fifth beaten 3 3/4 lengths. Left: Homeboykris in the winner's circle somewhere behind all those people. Right: Homeboykris in the post parade. 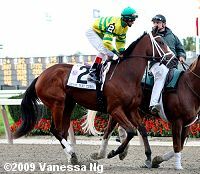 His trainer Rick Dutrow said, "I was going to be disappointed if we got beat; you know my game. He got ready at the right time and it set up good for us. Edgar said he didn't do much running around the turn. "I'd rather sit back and run him in the Remsen, but if (the owners) want to put up the money and go to the Breeders' Cup, I'd be OK with that. Left: Homeboykris heads to the winner's circle after the race. His jockey Edgar Prado said, "He's just been training sensationally. 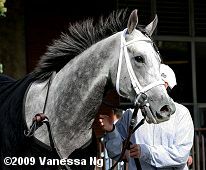 His last couple of works have been here, at Belmont, and he loves the track. The question was whether he would handle the competition, and he did. I think he's going to keep improving." 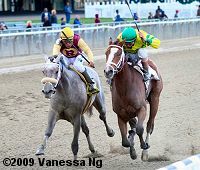 Right: Second place finisher Discreetly Mine returns after the race. The 6-1 fourth choice pressed the pace outside under jockey Cornelio Velasquez, took the lead in mid-stretch but could not hold off the winner late. 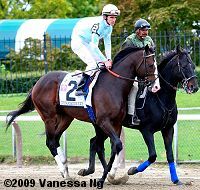 The Stanley Hough-trained colt improved his record to 1 win, 3 seconds, and 0 thirds in 5 starts with earnings of $174,350. Left: Third place finisher Aspire in the post parade. The 9-2 second choice settled just off the pace under new jockey Javier Castellano, encountered traffic at the 3/16 pole, but once clear, closed well to get third beaten 2 lengths. 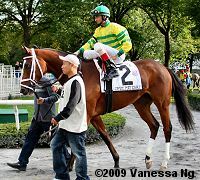 The Eddie Kenneally-trained colt improved his record to 1 win, 1 second, and 1 third in 3 starts, with earnings of $130,000. Right: Fifth place finisher and beaten favorite Dublin returns after the race. 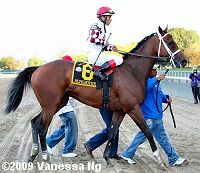 His jockey Ramon Dominguez said, "I thought he was pretty reserved early, but around the far turn he just had nothing. He didn't give me anything down the lane." Devil May Care (inside) and Amazing Maria battle in the stretch with the rest of the field far behind. 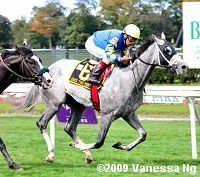 The distaff counterpart of the Champagne is the $400,000 Frizette Stakes (G1) for 2-year-old fillies going 1 mile on the main track, looking for an automatic entry into the Breeders' Cup Juvenile Fillies on November 6. Matron Stakes winner Awesome Maria was sent off as the even-money favorite in the field of 7, over 9-2 second choice Nonna Mia, a 12-length maiden winner last out and making her stakes debut. 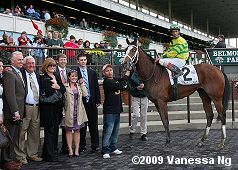 5-1 Devil May Care, a maiden winner in her debut last out, completed the top three on the board. Jockey Ramon Dominguez hustled Nonna Mia to a clear lead down on the rail exiting the chute and she set quick fractions of 22.70, 45.74, and 1:10.01 over the fast track while as many as 2 lengths in front of 7-1 Touching Beauty stalking her in second. Entering the stretch, Nonna Mia tired from the fast pace, as Devil May Care, fourth early, took over the lead at the 3/16 pole. Awesome Maria, who settled near the back of the field early, put in a strong rally down the center of the track but Devil May Care held her off by a head to get the win in 1:35.07. It was a long 4 1/4 lengths back to pacesetter Nonna Mia third. Left: Devil May Care takes her walk down Victory Lane. Right: Devil May Care in the winner's circle with trainer Todd Pletcher on the left. Pletcher said, "We've thought a lot of this filly all along. She showed up and ran a huge race for her second time out. She never gets tired. It was a big effort. The big question (about the Breeders' Cup) is how she will transfer her form to a synthetic surface. She certainly ran well enough. She was very professional for a second-time starter." 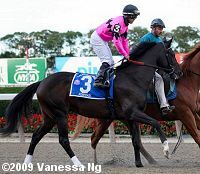 Left: Devil May Care in the paddock before the race. Right: Devil May Care in the post parade. Her jockey John Velazquez said, "She didn't break as good as I wanted to, but she recuperated and got into a good spot right away. I was biding my time between horses on the turn and then I saw (Touching Beauty) started lugging in and stopped and I had to make a premature move where I didn't want to go too soon, but I didn't want to get blocked in there. Then once I got her going I had to keep her mind busy and she finished really well." Left: Second place finisher and beaten favorite Awesome Maria returns after the race. 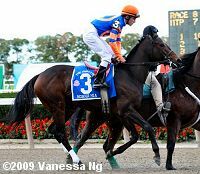 Her trainer Stanley Hough said, "I knew there was going to be a pretty active pace. I left everything up to Cornelio, and I was okay with where she was. Sometimes when 2-year-olds stretch out they get a little anxious. She made a great move around the far turn, got to the outside, and gave it her best. I think I'm going to give her some time off. That was four races within a short period of time, so I'll probably give her the rest of the year off." 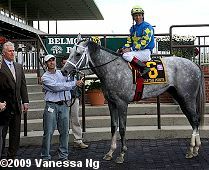 Her jockey Cornelio Velasquez added, "We stayed behind the speed and saved ground. 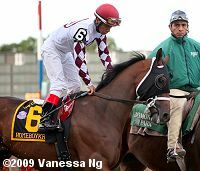 I followed Johnny (Velazquez aboard Devil May Care). She kicked in the last part of the race, but it was too late." Right: Third place finisher Nonna Mia in the post parade. The 9-2 second choice sprinted clear under new jockey Ramon Dominguez, but tired late to finish third beaten 4 1/4 lengths. 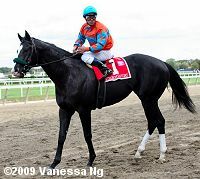 The Bruce Levine-trained filly improved her record to 1 win, 1 second, and 0 thirds in 3 starts with earnings of $67,300. 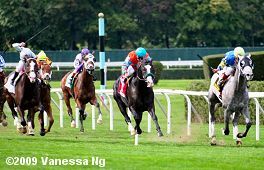 Kicking off the stakes action on Saturday was the $300,000 Jamaica Handicap (G1) for 3-year-olds going 1 1/8 miles over the inner turf course. 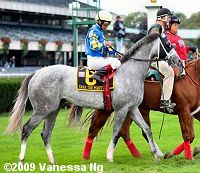 Hall of Fame Stakes winner Courageous Cat was sent off as the 4-5 favorite in the field of 7 over 5-2 second choice Take The Points, winner of the Secretariat Stakes at Arlington last time out. 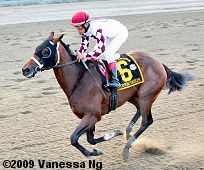 9-2 Grassy, winner of two consecutive allowance races and making his stakes debut, completed the top three on the board. Courageous Cat battled for the lead with 50-1 longest shot Chapin Beach first time past the stands and around the clubhouse turn through fractions of 24.84 and 48.63 over the firm course, with Take The Points stalking them in third. Down the backstretch and around the far turn, Chapin Beach held the lead through 3/4 in 1:12.96. Entering the stretch, Chapin Beach tired badly to eventually finish last, as Take The Points took over with 3/16 remaining, getting the mile in 1:36.41. 9-1 Straight Story, fourth early, came out wide for the drive but Take The Points held him off by a head to get the victory in 1:48.51. 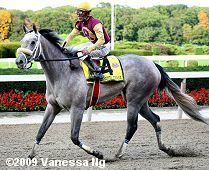 It was another 3/4 lengths back to favorite Courageous Cat third. Left: Take the Points walks down Victory Lane after the Jamaica Handicap. Right: Take the Points in the winner's circle with trainer Todd Pletcher on the left. Pletcher said, "It didn't quite unfold the first quarter of a mile the way we thought it would. We thought (Chapin Beach) would probably be on the lead. [Take the Points] got away a little slow and kind of swept around the outside, but it looked like he settled down the backside well and had a good trip from there. I think this horse is really finding himself now and learning how to run and learning how to finish off a race. I've got to talk to (co-owner) Jack Wolf. He's not Breeders' Cup eligible so that could have some impact. I would say one possibility is the Hollywood Derby; another would be to supplement to one of the Breeders' Cup races. We'll probably wait on that for a little while." Left: Take the Points heads to the starting gate before the race. His jockey Edgar Prado said, "He got a little rank on me early. I thought I was going to be about 10 lengths behind. There was a lot of speed in the race, but (Chapin Beach) got left and (Straight Story) didn't want to go to the lead - the pace was very moderate. He was very comfortable, and he was doing everything easily. He's a horse that can run on both dirt and turf. The times he was running on dirt, he was getting mature, he was getting himself together. I think now he's a better horse than before." Right: Take the Points heads back to the barn after the race. Left: Second place finisher Straight Story returns after the race. 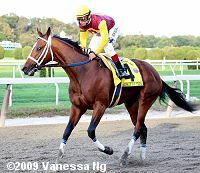 His trainer Alan Goldberg said, "He's been kind of an unlucky horse. The important thing was that he tried. Maybe we'll look next at the Hollywood Derby. He's a New York-bred; perhaps that's what we do next year." 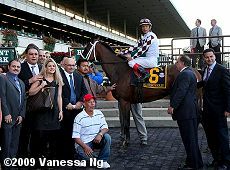 His jockey Javier Castellano added, "It was a race that could have gone either way. He never gave up." Right: Third place finisher and beaten favorite Courageous Cat in the post parade. 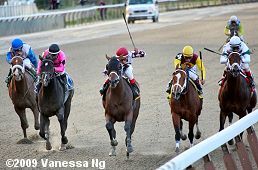 His jockey Ramon Dominguez said, "The fractions were slow; they were good."